Our hard work on building superior software solutions aligned with the unique goals of each project is rewarded with the trust of over 200+ happy clients as well as the recognition of reputable research & review organizations. 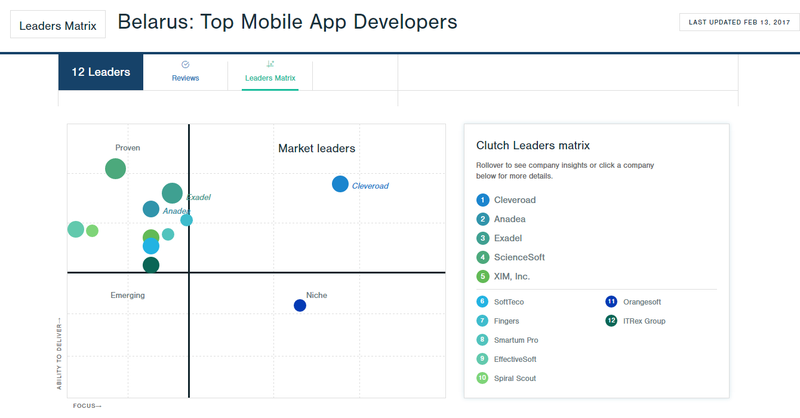 Clutch.co is an IT research service that spots top software development companies in various categories, including mobile app development, web design, web and software development. Clutch ranks service providers based on their areas of focus and ability to deliver results, where the most highly weighted criteria is feedback from clients. 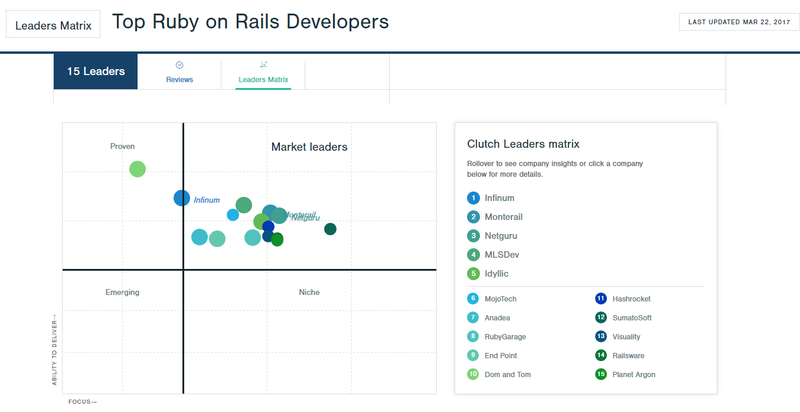 Top Web and Software Developers in Belarus, 2015 - view press release. 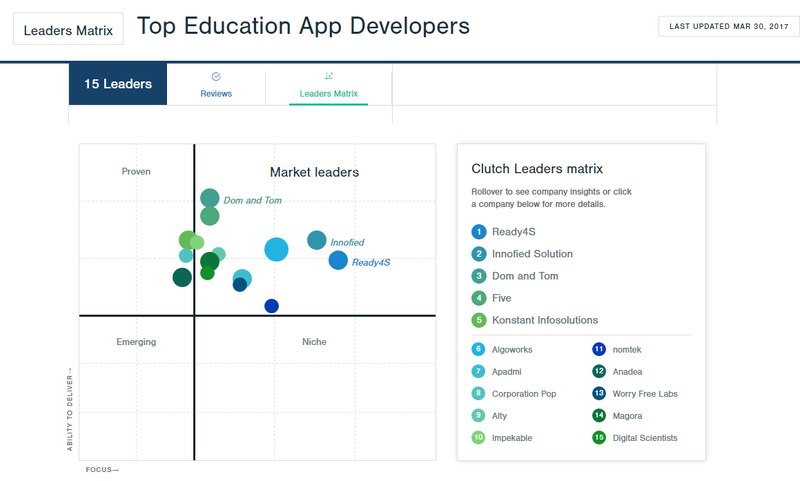 Top Mobile App Developers in Belarus - view leaders matrix. "After successfully delivering the application, we [strongly] believe that they are the best choice. I highly recommend Anadea to others and would urge all customers in the U.S. to work with Anadea." Visit our profile on Clutch for more reviews from our clients. SoftwareWorld is a review and rating website aimed to help you find the best software and app development companies for your business. SoftwareWorld featured Anadea in their list of top mobile app development companies in Ukraine - view the study. GoodFirms is a B2B research and review platform that aims to help the service seekers find the most compatible tech partner. According to the GoodFirms' assessment, Anadea has high rankings among service providers in several categories. Check our profile on GoodFirms. DesignRush featured Anadea in their Top 25 Software Development Companies press release - view the press release. Check our profile on DesignRush. Anadea is featured on Top Interactive Agencies (TIA), a curated selection of the most talented digital agencies across the globe. TIA focuses on bringing together a community of professional and passionate creatives. See our profile on TIA. Top Web Development Companies in Belarus, 2017 - view the list. Applancer.co is an online outsourcing platform that brings together project owners and certified app developers. Top 3 Trusted Mobile App Developers in Spain, 2017 - view the list. Top 10 iPhone app development agencies for December 2016 - view the list. Top 50 Software Development Blogs & Websites For Software Developers - view the list. If you are looking for seasoned and reliable software developers, let's work together. Contact us today!